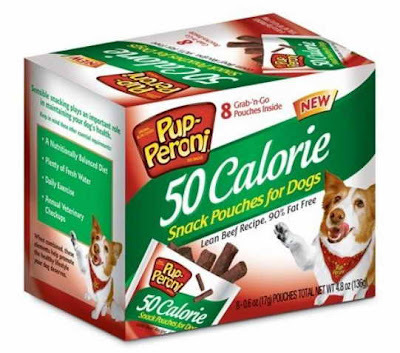 In one heck of a sign of the times I bring you Pup-peroni's new 50 Calorie snack pouch for pooches. You see it's not just people who are gaining weight. "The American Veterinary Medical Association (AVMA) has estimated that there are 41.2 million pet dogs in the United States. Other sources estimate 40 percent of those dogs, approximately 17 million, are overweight or obese." I find this canine obesity epidemic fascinating. Should we blame lack of gym class? Fast-food? Less walkable neighbourhoods? Maternal imprinting? Air conditioners? Big food advertisements? Celebrity product endorsements? Not fidgeting enough? TVs in their rooms? XBOXs? The internet? Their transition from a manual labour workforce to holding desk jobs? Over-protective parents? Human adenoviruses? High-fructose corn syrup? Artificial sweeteners? MSG? Social networks? Early weaning? Pesticides and industrial chemicals? Sleep deprivation? Or could it simply be that we're feeding them too much food?